In French film director Jean-Pierre Jeunet's 2001 romantic comedy "Amelie," the protagonist, played by Audrey Tautou asked her steward confidant to take along her father's toy dwarf everywhere with him on journeys around the world and to send back pictures of it in different locations. The idea was to provide solace for the bereaved old man grieving the loss of a beloved wife. Almost two decades later, a teddy bear dressed in orange has becomes a much-photographed similar mascot appearing in a number of conferences around the world - this time not to heal a broken heart but to reinforce the ongoing mission of gender equality. "The Teddy Bear is basically our presentation. We designed it in 2015 and my thinking at the time was it could be a symbol to attract more teachers and peers to attend our conferences and seek to learn more about gender equality," explained Wang Mianchen, a student from the Beijing Royal School (BRS), a private bilingual school opened in 2003. She made her remark on August 1 at a panel session in Beijing of the Forum on Gender Equality and Peer Education, organized by UN Women, the Fazheng Group and BRS. 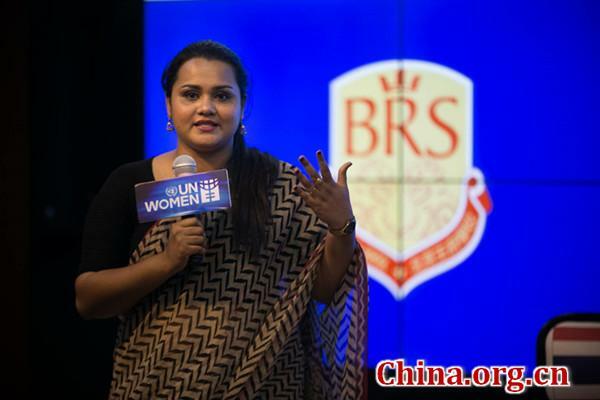 To encourage and empower Chinese people, especially the younger generation, dedicated to spreading the concept of gender equality across the country, Youth Envoy Jayathma Wickramanayake from Sri Lanka addressed the conference on behalf of Antonio Guterres, incumbent UNSG. "The pursuit of gender equality is an ongoing and intergenerational effort, which affects and must engage every member of society regardless of age, gender and nationality. Gender equality is a fundamental human right," stressed Wickramanayake in her opening speech. "Today's young people will influence the social and cultural norms of tomorrow. It is therefore critical we engage constructively with [them] in understanding why gender equality is good for everyone," she added. Wickramanayake called for young males to recognize their role in promoting the empowerment of their female counterparts by using and sharing their power and privilege, adding that the former "have the ability to shift the dominant idea about gender and masculinity." According to her, one in three women in the world is still facing some form of gender discrimination or violence. 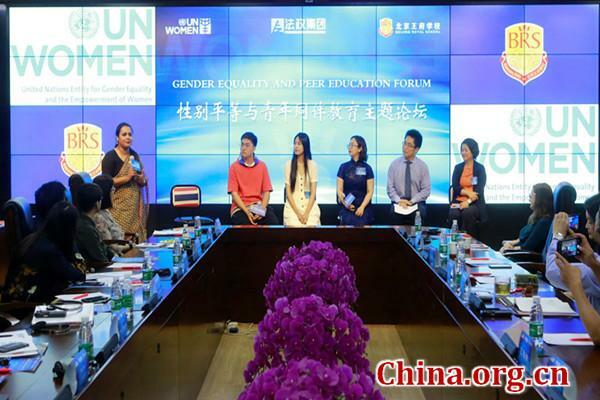 To facilitate and extend the influence of advocates pressing for gender equality and diversity, the UN Women in Beijing initiated a program entitled "Peer Education and Change Maker" in 2015. The program, in collaboration with Beijing Normal University, was launched in BRS, where it attracted 218 adolescents aged between 13 to 18 in its first phase. It is planned to reach 10 more pilot areas, including, Dalian in Liaoning province, Chengdu in Sichuan province and Shijiazhuang in Hebei province during the second phase to be launched shortly (September or October). By teaching young volunteers about current power structure and ways to reshape it, the program seeks to motivate volunteers to change the stereotypes, social norms and various forms of discrimination that have long underlaid gender inequality in China. The program also invites parents and teachers to assure and inspire teenagers in their efforts to pursue gender equality through daily conversations, writings, drama and screen presentations, as well as online and offline activities. As a male advocate joining the campaign three years ago, BRS student Han Yuexiang has been a change maker promoting the causes of gender equality, diversity and even LGBT (lesbian, gay, bisexual and transgender), all strange concepts to him prior to his participation. "I joined the group and saw lots of cases and learnt from my colleagues all about these things, enabling me to gain some little understanding," said Han. "After that I have felt more powerful and I have more reasons to do this. I want to do something for gender equality and gender diversity as a student from a new generation to join this group to show our power, to use the power as a student, as a boy and then as a man." The UN Women in Beijing has carried out a series of programs, like the Chinese leg of the global campaign named "He for She" and the illumination of an orange light irradiating the façades of landmark buildings in Hangzhou, capital of Zhejiang province and Beijing to implement and support the undertaking. The centuries-old dogma of a male- centered social structure in China has disintegrated with the growing awareness of gender equality among the younger generations.